There are several scientific organisations that keep an eye on the Arctic sea ice cover and put out graphs to inform us of the amount of ice that is left. You can see most, if not all, of them on the ASI Graphs webpage. One caveat: As Uni Bremen doesn't put out any numbers, we can't be sure this graph is correct. Larry Hamilton was in contact with people from Uni Bremen last year, so perhaps he can confirm the coming few days. On to the next domino! With each pass it does seem to be getting stronger. What do you think it will do to the remaining ice if it builds for a few days? Hello, Kate, and welcome. According to the weather forecast this cyclone will move away from the ice and start to lose strength in the coming days. What is interesting is the formation of a large high over the Central Arctic after the weekend. If this comes about we should see a lot of compaction, especially if it is accompanied by a large low over the Siberian coast. Then finally 2012 will start to look a bit like 2007 weather-wise. Has anyone thought to define "essentially ice free" yet? Thanks for the welcome Neven. It will be interesting to see what happens over the next week or so. Lots of 'peaks' still to come. One caveat: As Uni Bremen doesn't put out any numbers, we can't be sure this graph is correct. We can be pretty sure it isn't correct at all. Yesterday there still was a difference of 400.000 km² between NSIDC and Bremen. Three days ago even 500.000 km². Which means one of these two data must be wrong. And, whether record-lovers like it or not, we can point the finger to UNI-Bremen. Do allow me to make an educated guess. UNI-Bremen uses as standard "total area of at least 15 % of concentration". Presumely in Bremen's standard the floe-islands at a loose since four days represent less than 15 % compared to the sum of the ice free space, and therefore the sum of the floes area isn't added to the Arctic SIE. Nevertheles, what's in a record? According to the long term weather forecast a enormous high pressure system with 1035 hPa will establish over the arctic basin in the end of next week. This is, as I said, a long term weather forecast and therefore not necessarily very likely to happen, at least not in exactly the same way as predicted. But I still wonder what impact a high pressure system like this would have on the sea ice if it remained in such a posission for the last days of August. UNI-Bremen has revisited his data, altering the 2007 as well as the 2011 minima from 4,3 to 4,6 millions km². Which record would be, will be, the right one? Kris, different algorithms, different sensors, different frequencies. Some graphs will indicate records earlier than others. That's normal. We can't be sure until we hear from Uni Bremen. Maybe there will be a revision and the record will be broken next week. Yes, it won't be boring. KingKenny4ever, that high will compact the ice and push some of it out of Fram Strait. There is an enormous amount of compaction potential in the ice pack. CT area looks like the next domino but it hasn't updated for the 16th yet. By the way, Neven, thanks for this blog - its a great resource and meeting place for those of us following the fortunes of the sea ice. Not sure why I find it so fascinating - must be that morbid car crash type curiosity! And Neven quibbled when Eli proposed a simple bet. Still time to get your markers down for the Rabett Run Exacta. Neven, I don't understand your 13:31 remark: "What is interesting is the formation of a large high over the Central Arctic after the weekend. If this comes about we should see a lot of compaction, especially if it is accompanied by a large low over the Siberian coast." I'd say expansion & thinning then accelerated melt & disappearance much like 2007. Winds spiralling outward from the high into the low. During the reign of the Arctic storm over a week ago the opposite happened, when this storm weakened out there was actually a short halt in the drop of Arctic Sea ice area as the pack spread out a bit again. Of course this is an idealised spherical-cow-in-a-vacuum situation, beloved of physicists, but the point is valid. If we discount 2007 then every year since 2002 has been lower than the previous one. It will be interesting to see how much the volume was reduced by the recent cyclone. As to whether that was a freak or the first of many, the words of James Bond, the great secret agent and climatologist, spring to mind: "Once is happenstance, twice is coincidence, three times is enemy action." Remko, 2007 was a big compaction event because of a high that staid put over the Beaufort Sea/Central Arctic for almost the entire melting season. That high also sucked in a lot of warm water through Bering Strait and caused enhanced ice transport through Fram Strait. One of the reasons area and extent decline slowed down a bit after the storm weakened, was that the sensors were registering stuff they didn't see because it got washed over, waves became smaller and clouds subsided. The reason the decline was so fast during the storm, was not because of the storm, but because of a large amount of sea ice that was very weak and about to go anyway. I completely agree about the importance of volume, because in theory the extend and area we are watching could be as thin as almost nothing, and thereby irrelevant. I suspect the reason for the late area figures today, could be they want to release those data in a more "news" friendly hour seen with US eyes?? Remko Kampen wrote "Winds spiralling outward from the high into the low"
The winds might spiral outwards from a high but ice doesn't move in direction of winds, there is a substantial difference with ice movement to the right of direction of wind in Northern hemisphere. See Ekman transport. So the great cyclone dispersed ice and a high will compact the ice. I don't have the scoop on UB this year, but can tell you that DMI dropped 124k on 8/16, going below 2011 and now 155k short of their 2007 record. 1	2012	159,325 to date. Which is good, because there's a Presidential Election in the USA, and about half of adult Americans could use a wake-up call. About Mitt Romney, it's said "elementary school students have a firmer grasp of the science involved". Probably true, for most of the older elementary school students. And about the GOP - "just because they take themselves so seriously doesn’t mean they aren’t a joke. Especially, it seems, when the subject is climate." (For people that don't follow American politics, that's Grand Old Party - Republicans - Willard Romney's party, and the party of idiot Senator Jimmy Inhofe of Oklahoma). If 2012 is the new 2007 (when the Arctic sea ice melt got some frantic coverage because it was disappearing "too fast") - perhaps the issue will get some weight in the November election. On the potential compaction due to a central Arctic high: While this could shrink the area due to sheer compaction, it should also preserve the ice volume as it stays together and near the geographic pole, where sun radition is dropping in these weeks of late summer? lows = ekman pumping = bad for volume. Highs late in the melt season means open skys and more loss of heat to space. Open sky from highs can give more solar radiation absorbtion which can be bad earlier in the melt season. However, after mid August the top melt season has pretty much ended. I thought the highs in early July would be bad for volume but PIOMAS volume didn't drop much compared to previous years. Then lows set in for late July and PIOMAS volume accelerated downwards. So even in July it seems the Ekman pumping from lows is the more important effect for volume. This should, I think, become even more important as we get later in the season as more clouds from lows provide insulating effects. But just one month of such analysis is far too short and I could be wrong. I think PIOMAS will show rapid fall at time of Great Cyclone in early to mid Aug.
CT SIA fell by "just" 18,800 km2, leaving 2012 still 62,786 km2 away from a record. Anyway, I have posted two new related graphs today that some may find useful. The first (http://iwantsomeproof.com/extimg/sia_8.png) shows that the disappearance of Arctic sea ice over time isn't simply a factor of having less ice form every year (as some have stated), but is also happening because more ice is melting with each year that passes. The trendlines for the two--one falling, the other rising--show a clear and quickening convergence over time. The difference between the two lines--that is, the unmelted ice remaining at minimum--shrinks as those trendlines converge. Obviously, when the two lines merge not so many years from now, there'll be no ice left. Et voila. The second (http://iwantsomeproof.com/extimg/sia_9.png) shows annual ice area loss as a percentage of each year's maximum. Two things stand out immediately. First, overall ice area loss has risen from the low 60% range in the early 1980s to the high 70% range now. The second thing that stands out is the apparent step or regime change beginning with 2007. Prior to that year, the average annual loss was around 70%. But from 2007 onward, that loss has averaged roughly 77%. Interesting, to say the least. Hi all. I'm a lifelong weather fan who has been following the cryosphere for a few months, and I have a few questions. That you veterans might be better able to answer. 1) The sun is slowly setting on the polar ice, reducing any albedo feedback. I've noticed in general that the ice typically recovers to near normal levels in the winter, even after record years like 2007. Will this year be different? Will there be longer term implications for ice levels because the levels are so low this year? 2) If indeed all records are shattered, what effect will that have on the northern hemisphere winter in temperate areas? Will it impact the thermohaline circulation? Will the Siberian high be weaker? Will winter be slow getting started as more heat has to be dissipated over open water? 3) Are there good places to view methane data for the far north? Are clathrates releasing large amounts of methane? Are there sensing stations throughout the arctic? Is there a way to see trends? Addressing only point #1, I don't see any reason why the winter refreeze would be abruptly altered from past patterns--or at least, not to the point that we see a much lower maximum extent. We might see a delayed refreeze, since the more heat the oceans hold the longer it takes to radiate away (even though the warmth increases radiative efficacy.) We'll probably see even thinner ice over the next year. I do think there are implications for the medium term. If next year turns out to be as warm as I think, then this year will really tee things up for some serious drama around the 2013 minimum. I'd agree with Kevin, though at some point the residual heat has got to start pushing back the minimum date due to bottom melt. At first this will probably lead to a more rapid transition from minimum to maximum rather than a reduction in the maximum. When the maximum starts to seriously erode all Hell will break out because that means that in effect the previous Summer never completely ended -- there'd have been no Winter. Translating Catastrophe Theory into English is almost as hard as translating it into field theory. Basically, at some point Winter no longer cools enough to use up Summer. Before that Winter seems just fine. >" I've noticed in general that the ice typically recovers to near normal levels in the winter"
The size of the trend may not be quite as large in winter as for summer: eg PIOMAS volume down from 33k to 22k Km^3 a drop of 11k Km^3 compared to summer drop from 17k to 4k is a drop of 13k Km^3. But an 11k km^3 drop in winter isn't far off a 13k Km^3 drop in summer. There is a negative insulation feedback that might get stronger and if you optimistically assume that is going to be important then the winter volume might start to drop at a slower rate. If that happens then you might be able to say winter ice typically recovers to near recent year levels. However we haven't seens this year the downward trend in winter appears to be accelerating downward not decelerating. Even with that optimistic assumption of slower winter decline, the volume reduction in summer may well still continue to increase such that we soon get down to very low summer ice volumes. Sorry make that: However we haven't seen this yet; so far the downward trend in winter appears to be accelerating downward not decelerating. Of course....after looking at FACTS, its very easy to see that climate change (1) is happening, (2) is speeding up (3) is primarily caused by humans, and (4) we need to do something about it before we are SOL. 2) "Al Roger" posted the 10 lowest years of snow cover in North America above. Al, I've tried to Google for that data and have not yet found it....could you post your source so I could add it to my website? Thanks all.....again, especially a thank you to Neven for your diligence and education. PS. This is the first chart I put together back in March of this year that "put me over the edge". I'm a "visual" guy, and this chart told me what was happening. I wouldn't be at all surprised for it to be this year. There simply isn't a whole lot of Winter left up there anymore. We're rolling off the slope of a butterfly surface where Winter cooling and Summer heating were similar, and have to drop to a more stable state matching the fact that Summer heating is currently notably greater than Winter cooling sometime soon. As you can see, the winter peak last winter was near the 90's average. And the 3 decade averages show a MUCH larger deviation in summer than in winter. The point being that if the ice has X km^2 less extent in summer, that does not translate to that much less extent in winter. The gap (in the linked graph) between the 2000's average and the record year of 2007 was almost entirely erased by year end. So I wonder, this year being on track to break all such records, would that trend hold true or would we very likely see a record low maxima this year as well? Would the extra area melted stay melted this winter? could you post your source so I could add it to my website? I'm not sure, but I think Al got his data from the Rutgers University Global Snow Lab. I don't think it will impact the THC, but the weather might do weird stuff. That is for me the most intriguing question after the melting season: how will the weather react? I don't have the links, but somewhere these is CH4 data for Barrow. There's the AIRS data that Chris Reynolds regularly updates. APocalypse4Real is also busy setting up things. The slowest 5 day rate of CT SIA decline in the past 2 months has been between 8/8 and 8/12 for a 5 day average of 21,217 km2 per day. Even this bottom end of the spectrum estimate brings us to an SIA of 2.6 million at the end of August. his whole site is very interesting if you're interested in the evolution of perception of climate science. Great stuff, Seke Rob. I've put a link on the ASI Graphs webpage. What struck me about this year from the Norsex data in that graph is the the annual range is the largest in the post 2007 era. This isn't the case in CT's area series. You ask: "Has anyone thought to define "essentially ice free" yet?" My working definition of virtually sea ice free is 1M km^2 by Cryosphere Today's area. I'd say that's basically the same of 'essentially sea ice free'. If it happens because of a repeat of 2007's weather I'd consider it force-majeur, otherwise - If we cross the 1M km^2 mark this decade I'll consider myself wrong on previously asserting we won't see a virtually sea ice free state this decade. The data source is as Neven anticipated - Rutgers Uni Snow Lab. The actual data pages are down here. The minimum records dropped out of some numbers I was crunching to create some snow graphs on this site here. And I do my best to make sure all graphs have their data linked (although the snow graphs are still 'work in progress'). 1. 'typcally recovers to near normal' suggest recovery to near average vs my to near recent year levels. Maybe this is obvious to you and my explanations are a little pointless. can be useful. What you should see from Hamiltons cycle plot is that we are seeing is downward acceleration in area and extent in summer months while the winter months are more steadily downward. That is what I think is happening to cause "And the 3 decade averages show a MUCH larger deviation in summer than in winter." You may have understood this before and it is just me seeing ambiguity in what you wrote before. Not sure if this might help you extrapolate what you should expect. However I would suggest that extrapolation a long way into future can be dangerous especially without an attempt at understanding of the feedbacks. My impression from the literature is that the main two feedback in operation are the positive albedo feedback, and the winter insulation effect of ice providing a negative feedback. So far it appears to me that positive albedo feedback is stronger than the negative insulation feedback. I expect both to grow stonger. Feedbacks of opposite sign both expected to grow quite likely at different rates is possibly a situation where extrapolations may not hold. I am tending to increasingly doubt that the negative insulation feedback can grow to be strong enough. Not at all sure if that helps - could well be me having mis-interpreted what you were saying. The "10's" decade (only in its third year, even counting 2010, which is a no-no, pedantically speaking) has already crossed the 3 million km mark at minimum. Ouch. 10-12: 2:98 22.8% loss so far. Sorry about that - I was feeling "decadent"
Regarding the effect on the Greenland ice sheet, from the melting of the Arctic ice sheet: It seems to my "unscientific mind", that the Arctic ice sheet is serving somewhat like insulation, in that the Arctic ice is helping to "preserve" the northern portion of Greenland's ice sheet. Seems to me that as the Artic ice sheet disappears, it opens the door for greater melting of the northern portion of the Greenland ice sheet. The "feedback mechanisms" all seem to be working in concert over the last year: (1) warmer temps melt more ice, (2) more ice melt means more dark ocean absorbing more heat, (3) which leads to warmer temperatures still, (4) which leads to tundra melting and releasing methane, (5) which leads to more warmth, (6) which leads to more fires, (7) which leads to more smoke and ash particles deposited on ice sheets, (8) which leads to less albedo and thus more heat absorbed by ice, etc, etc, etc. This is going to get a lot uglier in years ahead, and I can't believe that many people really don't see it. I guess we should have learned ONE THING from the banking crisis: Government won't do anything until the Grim Reaper is knocking on the door. This quick melt in the spring, will allow the Arctic to become a large seasonal net source of heat for the northern hemisphere. Of course, some of this heat will go to melting permafrost with the carbon releases that entails. And, some of the heat will go to melting the GIS with the SLR that entails. Certainly there are other factors, but global warming and Arctic amplification are in the mix of considerations. As may be obvious I am new to all of this. I did not know what negative feedback effect there was in the winter, if indeed there was one. From an entirely naive point of view, a few degrees warmer average should make for a longer melt season, and a shorter freezing season, so that the trend is steadily downward. This is not the case. In the summer, it is X amount less, the following winter X+Y, and so on. I was thinking for instance, that it is possible that the weather or some other effect "Spreads the ice around" over the winter. This way, while area and extent might mostly rebound in the winter, the volume does not. If that were the case, then, at some point there is not enough icing (pardon the pun) to spread around the cake any more, and winter extents would start to fall. For instance, a lot is made of the "slush" created by storms and the like, which can quickly refreeze. Indeed, if nothing else, we've seen ice expanding faster in October than in the past (even if both the start and end points are below where they should be). So perhaps something acts to shear multi-year ice off the icepack, spreading around the arctic to enable fast re-freeze in the fall - at the expense of the volume of the multi-year ice. At some point though, the multi-year ice that is ripped off the central ice pack to create wide-spread slush would be depleted, and the rapid fall freeze up would be impossible - and so maxima would fall in step with minima. I do not know if any of this is correct science, I am just explaining a hypothetical scenario. This is really what I was asking about - if this year, we are X km^2 below any previous record, what does that mean for this winter, and the summer following? Obviously having a lower starting point means that the albedo effect gets cranking stronger and earlier, and that could make a big difference in the mid term, too. Is this record merely the latest of countless records to be broken this year, or does it have real meaning, in feedback terms, for the future? By "In the summer, it is X amount less, the following winter X+Y, and so on." - I was referring to this as a situation that does not happen. Indeed, typically, if the summer minima is X below average, and the winter maxima is Y below average, X is always (almost always?) greater than Y. It seems likely that one major factor in this might be the increased efficiency of heat loss to the atmosphere that occurs with no ice (or even thinner ice) versus "normal" ice as soon as the Sun sets for the winter (or even reaches a very low angle). This sunset typically occurs in October for most parts of the ice-free Arctic, and would explain the increased rate of freeze early in the season, even in the face of increased SSTs due to reduced albedo in summer. It would also explain to some extent the minimal reductions we've seen so far in the SI maxima. However, it seems to me that this factor will eventually be overwhelmed by the consequences of the albedo decrease, especially as the latter occurs earlier and earlier, amplifying the effects not only of the August sun, but of the (much higher angle, 24 hour duration) July sun as well. I asked: "Has anyone thought to define "essentially ice free" yet?" Chris Reynolds: "My working definition of virtually sea ice free is 1M km^2 by Cryosphere Today's area." How much less than having all connected sea ice being north of 85 degrees or connected to Greenland would that be? With all the mixing going on up there I don't see how there'll be any volume next Spring. Extent, yes, but little volume. If this year melted anyway then next year will do so faster. Jimboomega, dabize wrote "It seems likely that one major factor in this might be the increased efficiency of heat loss to the atmosphere that occurs with no ice (or even thinner ice) versus "normal" ice "
Re "or even thinner ice"
Yes it definitely applies with thinner ice as well as no ice. For any upwelling heat x W/m^2 there will be a maximum equilibrium freeze thickness. For low x, low GHG levels and low air temperature the equilibrium the equilibrium thickness will be high. As we force the situation with higher upwelling heat from Atlantic water, higher GHGs and higher air temperatures the equilibrium thickness reduces. So there is a downward trend in winter thicknesses forced by these factors. While those are moving in the wrong direction, is there any expectation of acceleration in these terms? I don't see much risk of that. So much for forced response, what about response to albedo feedback resulting in later start to freeze season as the heat has to be given up before the freezing starts? I suggest that in the centre of the pack, ice does build up its thickness to close to the equilibrium thickness. So although the freeze starts later, thickness rapidly builds and you only lose out on the time where ice thickness is building only very slowly. Round the edges of the pack, instead of a 6 months freeze season, there might only be a couple of months such that ice thickness is still rapidly growing rather reaching maximum equilibrium thickness for the upwelling heat, GHGs, & air temps. So a slightly later start to freeze season will still have an effect on such areas around periphery of winter pack. >" if the summer minima is X below average, and the winter maxima is Y below average, X is always (almost always?) greater than Y." if you want to do some calculations. you might find the 34 columns one for each year by 365 rows for each data set more convenient than one long column of data. There is always weather noise that creates instances of area or extent not moving in the direction expected. So I doubt 'always' or 'almost always' is likely to apply. I think you are likely to be better looking at whether trend lines are accelerating or decelerating. >Jim Williams wrote "With all the mixing going on up there I don't see how there'll be any volume next Spring. Extent, yes, but little volume. If this year melted anyway then next year will do so faster." I want to see the PIOMAS volume following the storm, at 2012 minimum and at 2013 maximum. Wipneus found a pretty strong straight line relationship between volume and extent such that if there isn't much volume there probably won't be much extent either. But I guess it depends on how much is little volume and it is also possible to fit a curve that does what you suggest through the data. Perhaps, at least for the fall, the effect of increased cloudiness can step in. I mean, with much more open water and thus warmer temperatures, cloudiness can increase substantially and can even block more outgoing radiation. This could be some additional positive feedback for ice loss. Funny you should mention 85degN, the area enclosed by that line of latitude is about 0.966 M kmsq. Here's what it looks like. Now imagine that ice smeared across the north of Ellesmere Island and the adjacent coast of Greenland. That is what I mean by virtually ice free. Here are the volumes at maxima for years since 2007 in order: 23.865, 25.159, 25.082, 23.402, 21.961, 21.906 in thousand km^3. There's a long way to go before volume in Spring is as low as you seem to think. Average thickness is biassed at that time of year by the large areas of thin ice around the peripheral seas outside the Arctic, and it's inside the Arctic that thickness has a bearing on summer melt. However in March 2011 most of the Arctic was in excess of 2m thick. The summer melt meant that by September thicknesses were, as in recent years, substantially lower, at around 1m thick. Implying a seasonal thickness loss of around 1m (conservative). To convert virtually all the winter ice to open water two things must happen, either one of them or both; 1) increased thickness loss during the melt season 2) reduced maximum thickness in winter. Jim Williams, Sorry reading little volume I assumed you were talking about September despite you specifying Spring. Sorry about that. Assuming you did mean Spring see Chris Reynolds' answer above. While I can imagine mixing having an effect in slowing the start of the freeze up, I still think it will freeze more than a thin layer. Guess it still depends on what you mean by little volume. 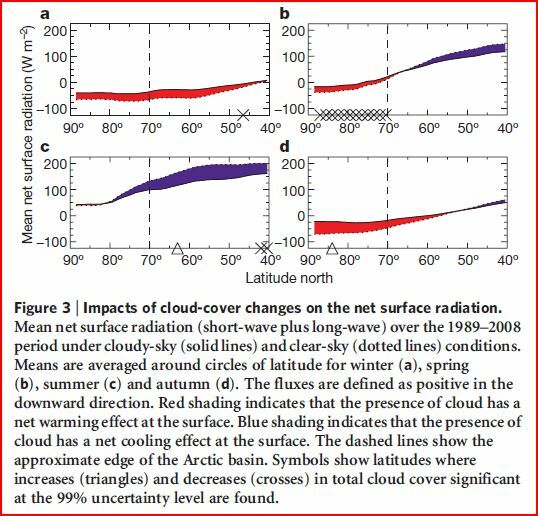 See this snip from Screen & Simmonds "The central role of diminishing sea ice in recent Arctic temperature amplification"
Figure d shows the increase in warming effect of clouds in the Arctic. However note also the cooling effect of clouds in summer. And bear in mind that the interplay of forces is complex. With regards the warming effect in autumn this is counterbalanced by heat loss in the very process causing the clouds. Substantially increased open water both absorbs solar energy warming the ocean, en effect which I suspect overwhelms the above summer cooling of clouds - evidence for that? 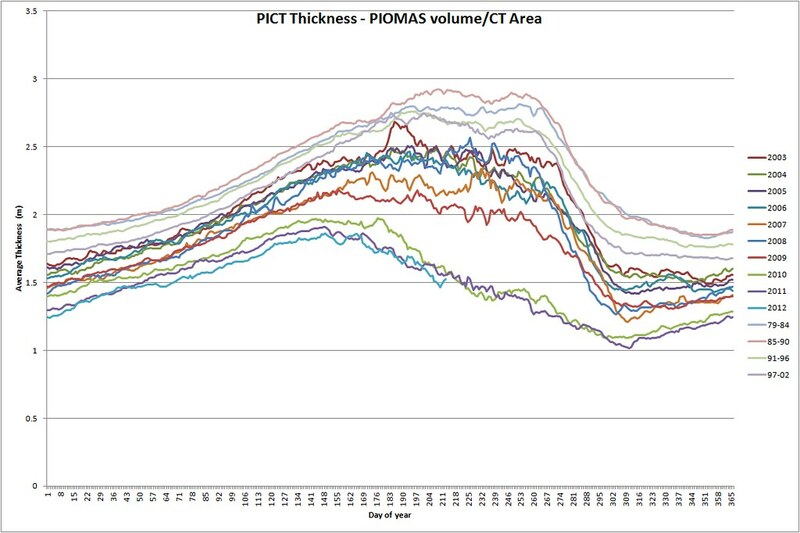 The PIOMAS volume loss and increasing area/extent falls. But that open water also increases heat loss to atmosphere, thence space, in the autumn. Again I suspect that this is overwhelming the +ve radiative forcing of clouds. Evidence for that? Since 2007 when the substantial open water has occurred, the annual range of volume has increased - winter volume isn't decreasing like summer and this implies growth in the autumn has increased - as indeed the numbers show. What's been eating at the back of my mind for over a month now is a graph by Neven that divided extent by area, and which underwent a very significant change in its shape three years ago. It looks sort of like it has run out of extra ice to spread around. It goes along with the way the ice just kept melting this year. The whole system looks like it's running out of reserves. Jim Williams, here is the graph. I have been trying to think of an explanation of the sudden change in shape from 2010, but I cannot come up with anything. Thanks Alan, Volume verses Area...Yes. It sure looks like the bottom fell out of something in May of 2010 -- bottom fell out, or something ran out. That sudden drop is a bit of a mystery. Chris Reynolds has speculated about it. I thought it had something to do with PIOMAS overestimating thick ice, and underestimating thin ice. Can't find the links right now, have to go to bed. The discussions are in Chris' Dosbat blog (see blog roll) and one of the PIOMAS threads, April, May or June. Actually, 2009 show some signs of change. The maximum is very early compared to previous years, and there is a decline during the summer which is slow but still greater than before. Was there any change in collection for either of them about that time? The graph seems to say that before 2010 the average thickness would continue to increase all summer, probably because of melting of ice at the edges first. From 2010 on the average thickness peaks early in the year -- is that from melting everywhere starting early? More bottom melt? A bit OT on this thread, but I am wondering whether the NWP is open at this stage. It looks like the Southern route might be, but I am not sure about the Northern Route. It seems there is some lingering SI stuck between Banks I and Melville I. That may take a while to melt if at all, at this time of year. Crandles' graph shows that the minimum thickness didn't occur until December at one time. Recently this has been November, but presumably this will occur in September when the ice melts completely, so the graph should continue to change its shape as well as its height. >"The graph seems to say that before 2010 the average thickness would continue to increase all summer"
If there was a lot of thick ice and a bit of thin ice, you can imagine that area declined at a higher proportional rate than thickness this would keep the average thickness going up for most of the summer. Now that the ice is not as thick, the same rate of thickness decline (in m per day governed by available heat) is a much higher proportional rate of decline. Consequently things have changed so that thickness is declining at the higher proportional rate than area. So the average thickness now declines rather than continuing to increase. Is that a sufficient explanation or are there problems that that doesn't explain? I’ve been digesting Jim Williams’remark on ‘essentially ice free’ all day now and I’ll end it with these musings. MODIS tile r03c03 still shows the mesh pattern, though the coastal zone against Greenland/Ellesmere looks weak. Less than 1.4 Mkm2 of the pack shows the ‘mesh pattern’. I've come to view that pattern as ‘safe’ in a 2010-2011 sense. For the minimum I estimated 2000 km3 minimum volume two days ago. Just enough to get to winters’ protection. To me, today’s situation isn’t far from ‘essentially ice free’. The amazing sight of an ocean filled with bits and pieces could emerge even this year as we approach 2000 km3 volume. The pack is very close to complete melt out. It is the pattern that makes me hold my breath. Through the last two years I’d imagined the pack to gradually shrink to a 1 Mkm2 blob against Ellesmere/Greenland up to '16 or '17. But it looks like it’s not doing that. It is spreading out over an area approximately 4 Mkm2. Look at NOAA/NCEP SST today. The -1.5dC area is almost confined to where there’s more or less concentrated sea ice. ‘Essentially ice free’ may be an ephemeral state, gone while we’re busy defining it. What’s left now is not going to be restored through next winter. The bell rang ’10-’11, symptomised through the Hudson/Baffin-, ’11-’12 through the Kara Bulge. The first kept regional seas open op to mid-winter. The second even produced open seas in February. It crept through to the Laptev. That Sea had anomalous thin ice at the beginning of this summer. So there’s where I stand. I still think PIOMAS is on the conservative side for at least 500 km3, since Polarstern reported mostly 0.9cm near the Pole late last summer. Ice Bridge came up with 1.8m in Beaufort spring ’11 and, harsh winter or not, even less this spring. Latent heat is crushing in, unforeseen through climate modelling. I can’t imagine how the remains can survive next El Nino warm year. Ice free will be September 2013. No blob, completely gone. In this pessimistic state, I even think it’s hard to imagine an effective FYI refreeze ’13-’14. Lodger's bifurcation may kickstart straightaway. Cyclones will destratify the essential cold layer. For the impact on NH weather patterns, watch the NOAA/ESRL daily climate composites and the CRWS Jet Stream Map Menu. They have been showing some strange loops through ’11 and ’12. It’s bound to get even stranger. Kind of late to Jimboomega's party, but one of the things that is important is that the ice outside of the Arctic Ocean has declined precipitously over the winter, so if you want something to look at, how about the odds of Hudson's bay not freezing over completely. As it is, ice in the Baltic, except at the extreme northern end is now rare. That ice is captured in the various sea ice area series. Hi Werther. Intriguing questions. I'll run some figures through my Solargain (CAP2E x INSOL) worksheet, and see what kind of net annual forcing we'd get from a sea ice free Arctic ocean (less peripheral regions like the Sea of Okhotsk). What do you think is reasonable for an earliest ice free day? Aug 15? Sep 15? Others? This is a critical assumption, since it largely defines the annual Solargain. Perhaps I should just build a curve of net annual forcing vs 1st ice-free date, with a range +/- maybe a hundred days around the solstice? Specify an offset range to include the more likely possibilities, like -30 days to ~100 days past the solstice (I can solve for the end point when net INSOL goes to zero)? What would you like to see? Thanks for your response. The farm in Tassie is going well. Very busy,that's why I haven't been posting much this year. BTW, speaking of Tassie have a look at this . Slightly OT on a blog about Arctic SI, but still another evidence that CC is happening everywhere! Re Hudson Bay - my $0.02 on the topic. I was thinking just what you said above last year when I joined the HB freeze thread over at AmWx. What happened was this - the initial freeze was delayed well beyond normal - large areas of ice free remaining into December , if I remember rightly - followed by a very rapid freeze-up by the end of that month. I predicted freezeup about 2 weeks too late! Here's what I learned: Turns out that there isn't any correlation to speak of between the freeze timetable of consecutive years in HB, suggesting that there is no long term heat accumulation occurring there due to AGW (or anything else, for that matter). HB is also very isolated from ocean currents and CC-related changes that might nearby areas such as the CAA. Finally, even if the freezeup date continues to be delayed, it will take awhile before HB fails to freeze entirely - quite unlike a place such as - say, the Kara Sea. So it might be a good system for looking for direct synergistic effects among locally acting changes caused by CC, such as changes in snow cover, local albedo and consequent effects on surface atmospheric temperature. However this also makes the timing of HB freeezeup extremely dependent on the vagaries of weather, and relatively insensitive to the kind of interactions that we've been discussing on this blog - incremental year to year changes that propagate throughout the Arctic and thus may provide tipping points for the system as a whole. crandles, I started to agree, but now I'm not so sure. Shouldn't we still expect the average to increase late in the season when there's mostly the thick ice close to Greenland? You still may be right, but I'm not sure it's described clearly enough. Something about the remaining thick ice melting (or spreading) out too? Werther, I'd be inclined to bet on complete melt-out next year, but I admit it's a guess with nothing real to back it up. The system is unstable and at some point the store of cold will be depleted. The only real question is when. 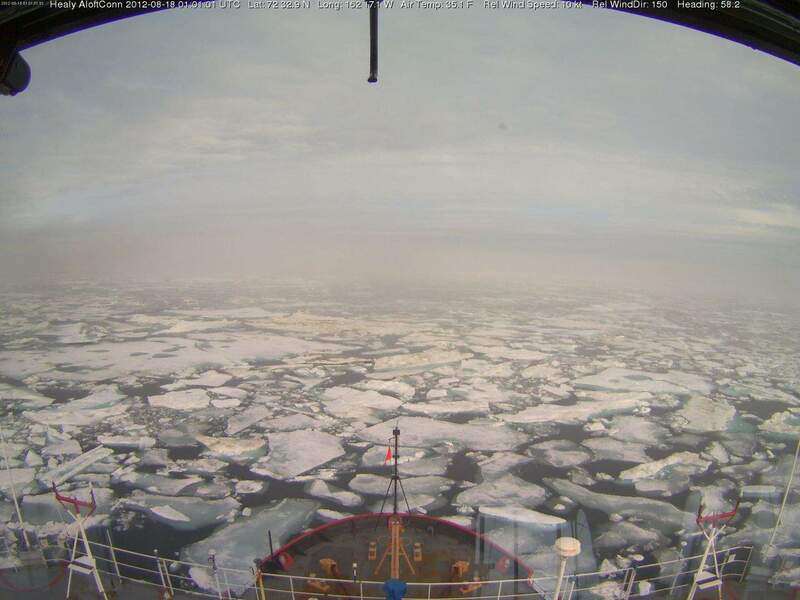 Is this image from the Healy showing storm- damaged ice, considering their position? Certainly looks like it, Kate. Interesting to see around 10%-20% of floes appear discoloured. I assume thats algae on top, indicating they've been flipped over recently. I'm in agreement, but would add that the deep mixing that our little storm produced might come into play. When an open water polynya forms it's due to the chilled fresh surface water losing buoyancy and being continually replaced with deeper, warmer water. Normally the density of the brine below limits the depth that the fresher layer can sink so that polynyas are limited to regions where stratification has been disrupted. If our storm has disrupted the stratification to 500m over a very large area, what is to stop an enormous polynya structure from forming this autumn, essentially preventing a freeze up over the winter in any area where the storm was active. If we allow that such a structure could form, wouldn't it eat away at any iced areas adjacent to it, disrupting the stratification in these areas because of the induced turbulence? Once started, further cooling of the atmosphere would simply speed the vertical mixing, until either the whole 500m cooled to near the freezing point, or more likely, until spring insolation allowed the upper layers to warm enough to regain it's buoyancy. Posted by: Buddy Tumbarello | August 17, 2012 at 20:48"
A thought has crossed my mind. I seem to remember reading somewhere about Ireland having huge problems with peat bog fires that lasted for years. As the Tundra is basically a bog that is in fact very deep but does have a lot of surface water because of the permafrost. Once the permafrost goes would not that mean the present surface water sink establishing a new water table much deeper. If that were to happen would then not there be the possibility of the upper bog drying up and possible bog fires that could last for years? In this case would not that then cause the establishment of a micro climate that could impact things at least in that area even in the coldest time of the year? Or is that all something that if it does happen in the far future and/or something that is too far alarmist? Neven, this is great work, thank you! This discussion moves me to chime in for the first time, these are fascinating days and I don't doubt that records will all fall. However, as a scientist (but not a climatologist or oceanographer), I do think that a couple of things bear keeping in mind. First, I'm not sure it makes sense to let ourselves focus too much on the bottoms and tops of curvy graphs. Trends in the shapes of the curves are probably more interesting and important. In other words, I think I'd shy away from talk of 'essentially ice free' in favor of the possibility of new equilibria emerging for summer mins. A smaller ice extent means less energy available to the ice from atmosphere and water near it. Couple this with the early darkening of extreme north latitudes and it may require much more profound changes than we are seeing to kill the ice overall. An interesting illustration of this is the CT SIA plot. Recent years see flattening out at about 3M km^2. One possible extrapolation would be a wider plateau each year rather than a substantial drop below some new equilibrium minimum. This is similar to the case made above for max area remaining relatively stable. In other words, the curves might change shape, becoming less sigmoidal and more stepped over time. By contrast, I think the question of NHC is profoundly interesting. Warm open water in the summer without ice to melt could make a very big difference to the pumping of moisture into the air. Similarly, the more abrupt seasonal shifts in ice cover could prove very important. I would be fascinated to read what you climate modelers have done to game out those new thermal loads. Great group of commenters here, very cool posts and admirably civil dialogue! Thanks a lot, bill kapra. That's interesting about a new plateau and everything. I'm not sure at all about what might happen in the near future, but it's just not looking so great. One comment wrt the slower change in maximums area/extent. 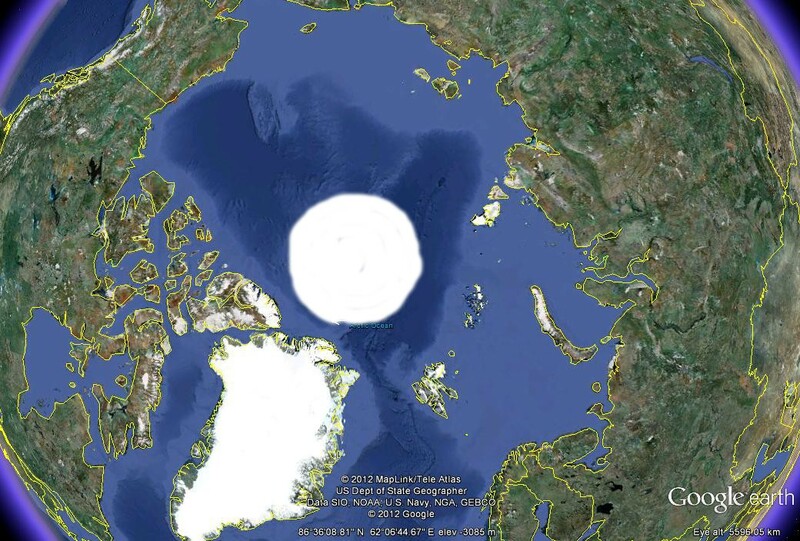 Since the Arctic is largely landlocked, this puts an upper limit on what the maximum could be. Until the winter warming has progressed to the point where the maximum is no longer reaching right up to the surrounding land, we wouldn't expect the maximums to drop much. But once the winters are no longer cold enough to refreeze the entire arctic ocean, then the maximums may start dropping more substantially. Alan Clark up thread enquires about the gaps appearing in the Ice.Volume/Ice.Area Graph while bill kapra describes a 3Mkm^2 'plateau' (post-2007) seen on the CT SIA plot. My own point of wonder is the cause of the narrowing of the spread of the PIOMAS anomalies following the impressive spring/mid-summer spreading from 2010 (causing the downward spikes on the PIOMAS anomaly graph). The present state of hypothesis sloshing round my mind is that the ice extent at the mid-summer when the melt is at its height is an important consideration for ASI. 2006/7 perhaps can be seen as the years when the mid-summer melt truly got to grips with ASI, got it away from the Siberian & Canadian shoreline early enough to get stuck into it before the Autumn sunlight wanes. It is also evident in the June.to.August Extent figures. Prior to 2006, the melt over these two months was stuck on -3Mkm^2, then jumps to -4.5 to -5.5Mkm^2. And the spikes in the PIOMAS anomaly are perhaps explainable as the height of the summer melt now arriving in the Arcic Ocean just early enough to make a big difference but as the Autumn arrives running up against the ice pack now concentrated round the pole where it is further away from warming currents & winds and more inclined away from the sun. Thus the anomaly shrinks back forming the spike. Relative small upward adjustments, and big prelim-prelim drops, latest -137K. DMI is looking very very close record-wise. For the first time since a while I'm not seeing any big day-to-day changes on the Uni Bremen SIC maps, so things should slow down soon. I agree almost entirely with what you say. I only say almost because I think how this season ends will be very instructive as to the processes at work, in particular the issue of how fast ice north of 80degN will go. So I disagree with regards the shapes of the minimums, CT area for 2007 and 2011 show late season plateaus, I think this is significant. NSIDC is no slough either, and with the publication of daily extent [prelim values], no longer needing to pixel count and ruler-line drawing to know that what we see is 4.6M Km^2, slightly leading IJIS/JAXA's prelim. This Bremen graph is just crazy. With still another month of melting to go, it's as if the trend has got lost and looking for the way out! About a -25K for actual... piccolo passi towards the absolute record. It is not only Bremen, but more or less all of the graphs that are looking for the shortest way out of the box! Do I sense a collective holding of the breath? What's the earliest sea ice minimum? Absent the esteemed Mr. Hamilton's [circle of trust] figures, we can only eyeball and pixel count, but today, taking the DMI chart and put a lead line in, they are practically matching already the record minimum: http://i137.photobucket.com/albums/q210/Sekerob/Climate/DMIMinimum.png (Zoom if you like to convince yourself). hehehe... Espen, our humour only masks our concern, witnessing an anthropically accelerated geologically timescaled event within our lifetimes. SIE according to IARC-JAXA is now (18th august) at 4.664.219 km2. Yesterday it was still over 4.8020.219 km2, an impressive century and a half for this day of the year. Regarding Bremen, on top of the other odds it looks like the graph got stuck at August 15th. Not to be confused with Michel Piccoli of course. DMI going down but still 87k above 2007 minimum. Among the notable CT SIA records 2012 has chalked up so far--greatest 10-day, 9-day, and 8-day decreases on record; earliest to fall below 9, 8, 5, 4, and 3 million km2; fastest drop from maximum to every break ppoint; etc.--there's this one for which 2012 took first place as of today: largest percentage decrease from maximum ice. 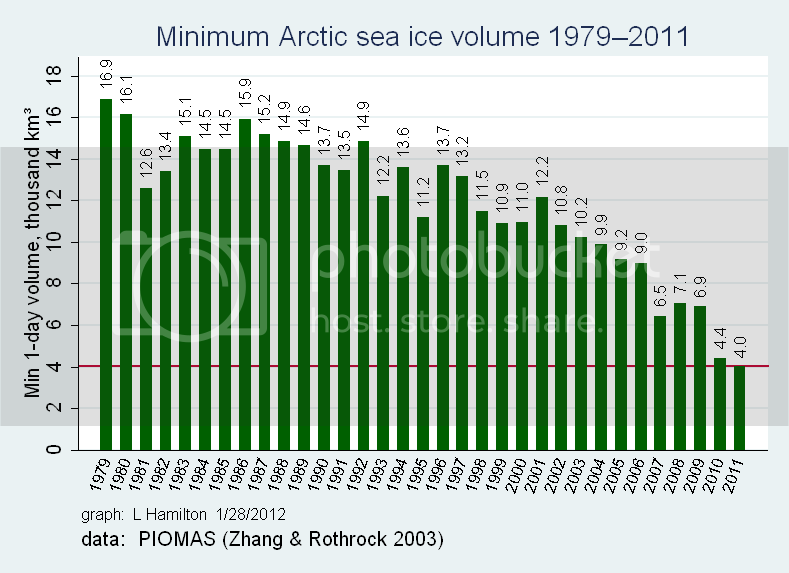 2012 has lost 78.54% of the ice it had at its maximum, just edging out the 78.38% lost overall in 2007. 2012 hasn't yet lost as many square kilometers of ice as 2008 did, but it should get there before the refreeze starts. 1. This year has dipped below 3M much earlier. So is the flattening out also a function of the time of year? 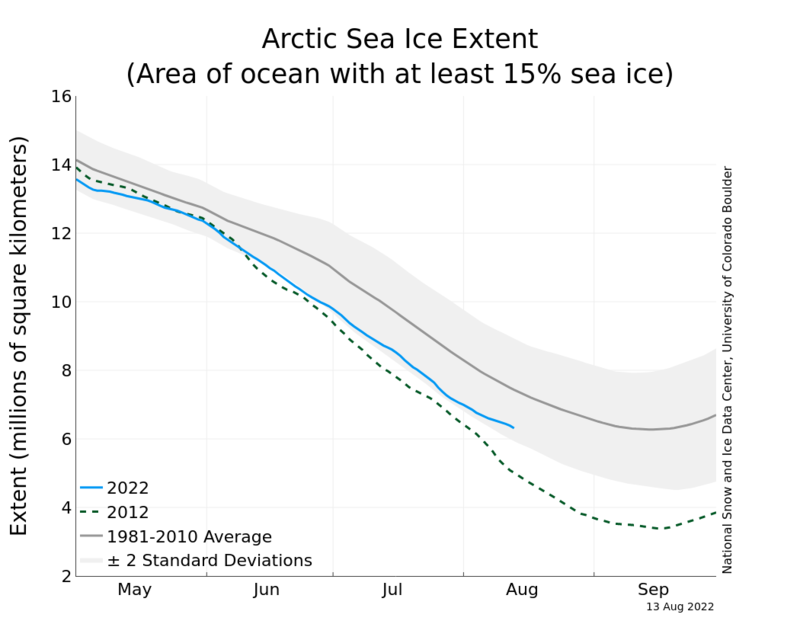 By early September there is clearly much less insolation in the Arctic Basin. But is that so much of a limiting factor with nearly a fortnight of August still to go? The next week or two will tell. 2. While the recent graphs do seem to be flattening, most of this seems to me to be caused by a failure of the rate of refreezing in October: witness the massive 2.6M anomalies of Oct 2007. 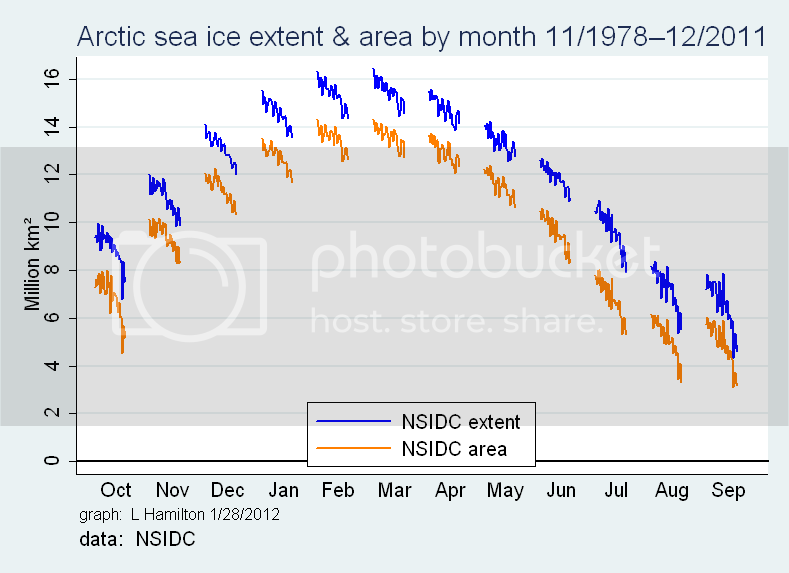 It looks as if 2007 was in a much stronger "defensive position", with all of the remaining ice packed tightly together. Of the 2012 vintage, I would consider all of the areas which are shaded yellow to be very vulnerable to complete disappearance; and all of the orange to be likely to decay significantly. ...is largely coloured orange in the CT comparison maps above. And it ain't in a good way. ...further to the above, I think the other factor is the potential for further storm damage. we have a large margin of this vulnerable ice on three sides of the Arctic Basin, and large areas of open water in which storm conditions and storm waves can develop.